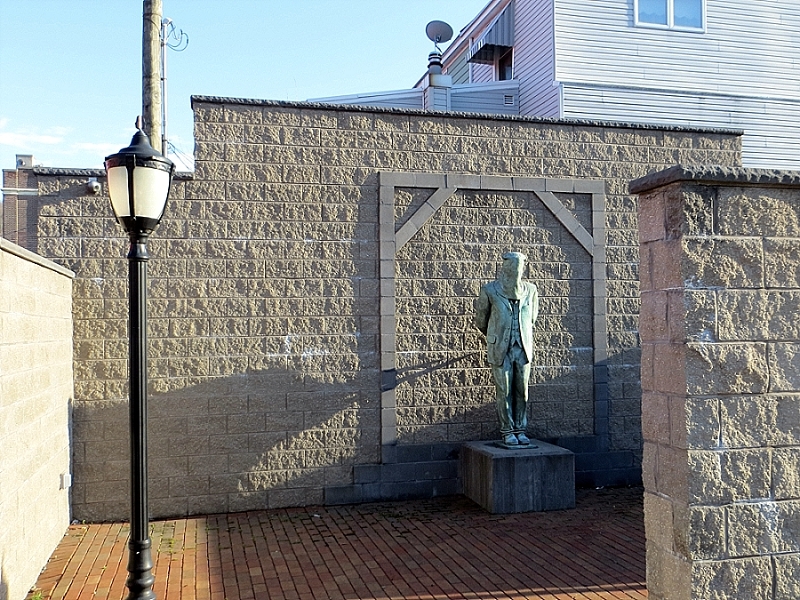 September 16, 2017 — The statue is so disconcerting, that the town erected it behind a wall. The statue is on the corner of W. Centre and Catawissa Streets, and the block wall that blocks it from the block forms one of the boundaries of the tiny Molly Maguire Historic Park. Stepping around that wall revealed no patch of grass or playground. 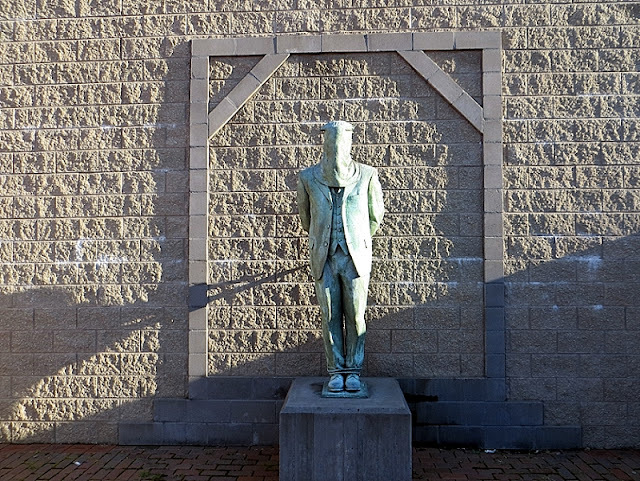 Instead, I found myself inside of a stone and brick box, the centerpiece, the only piece, a solitary hooded man, hands and feet bound, the outline of a gallows behind him. Obviously, the imagery immediately sparked for me ideas of lynchings in the South or maybe violent coups in far-off countries. But then a second look belied that impression. The figure about to be hung (for there wasn’t yet a bronze noose around his bronze neck) was clad in a suit and vest. Had he a watch chain dangling from that vest, I might’ve thought him an old-timey banker. Eventually, hard as it was, I was able to turn my back to the doomed man, where I saw in front of me three large black plaques of stone on the inside of the wall…and was completely confused by the story they told. 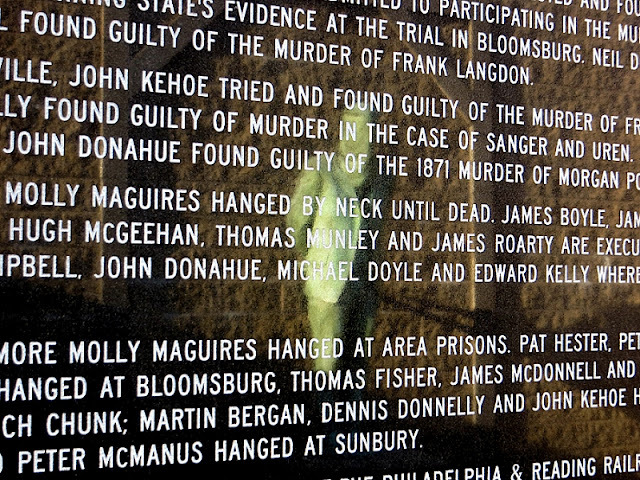 A short story’s worth of copy filled those plaques, and including names and crimes and a chronology from a particularly violent stretch of mid-19 century Pennsylvania. From the little I could gather in situ, between the years of 1862 and 1879 there was some sort of coal mine witch hunt. Or a coal mine mafia. There were at least lots of coal mine murders. It wasn’t until I returned home and dug through the Internet that I got some clarity on the story. But only a little. Like much of central Pennsylvania, Mahanoy City was dependent on the anthracite coal that riddled the region. This was before the days of cable, mind you. But they weren’t just dependent, they thrived on it. That allowed for a lot of corruption in the coal mining companies, the courts, the police, the Catholic church, area residents. And that corruption yielded a lot of what could only be termed assassinations. Some got a bullet in the head from vigilante guns. 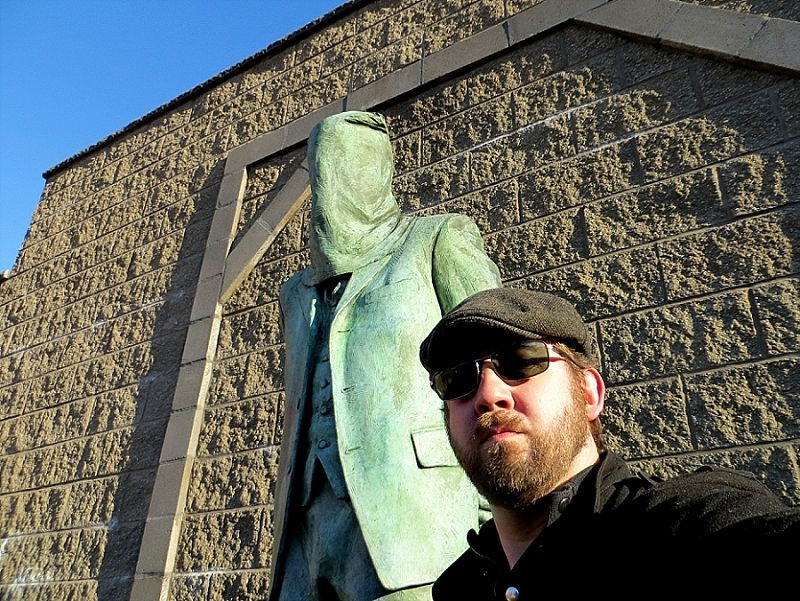 Others were strung up like the bronze man behind me under false pretexts. 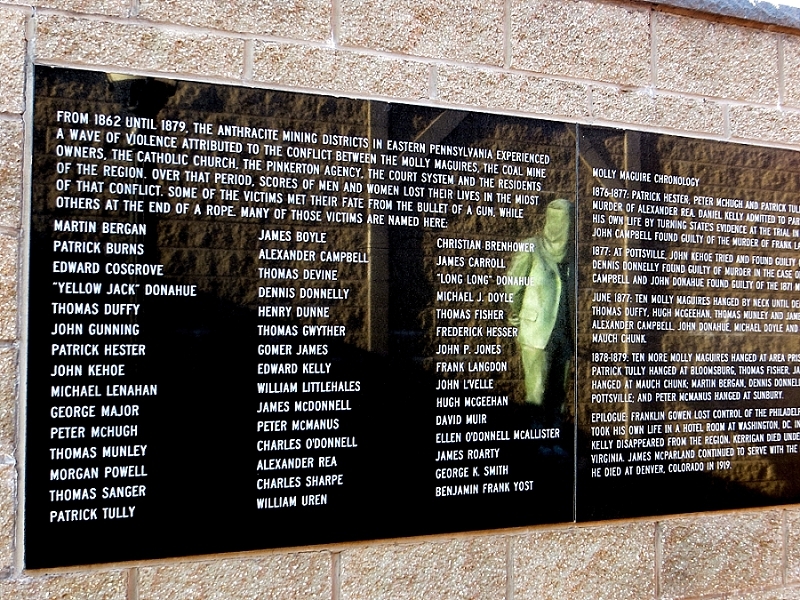 The plaque at the monument lists 45 people. 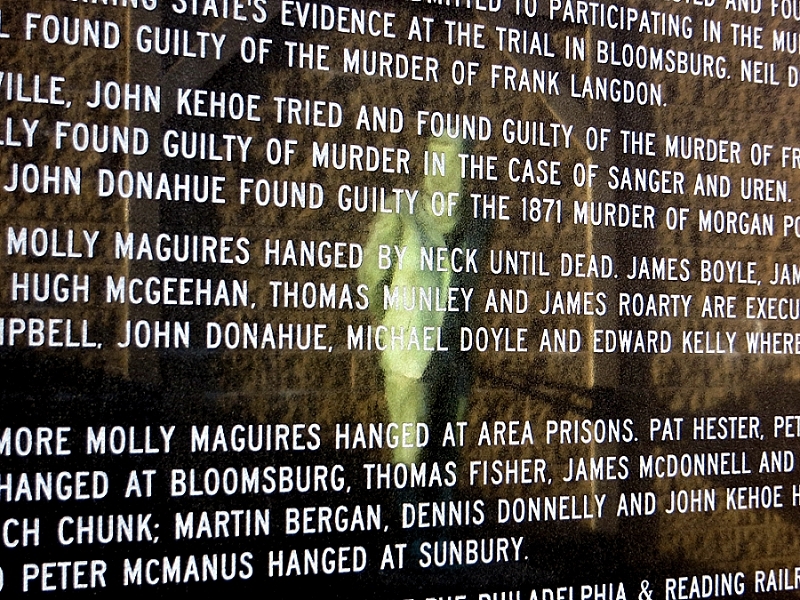 The victims were mostly accused of being part of a secret society of Irish activists called Molly Maguires. So this wasn’t just a matter of greed. It was also a matter of prejudice. 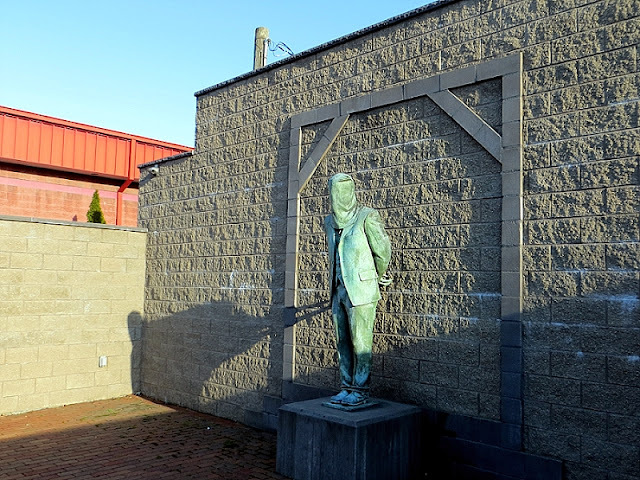 It was believed that the Mollies had infiltrated the Pennsylvania coal business and threatened to upend the delicate balance between the filthy rich and the filthy workers. 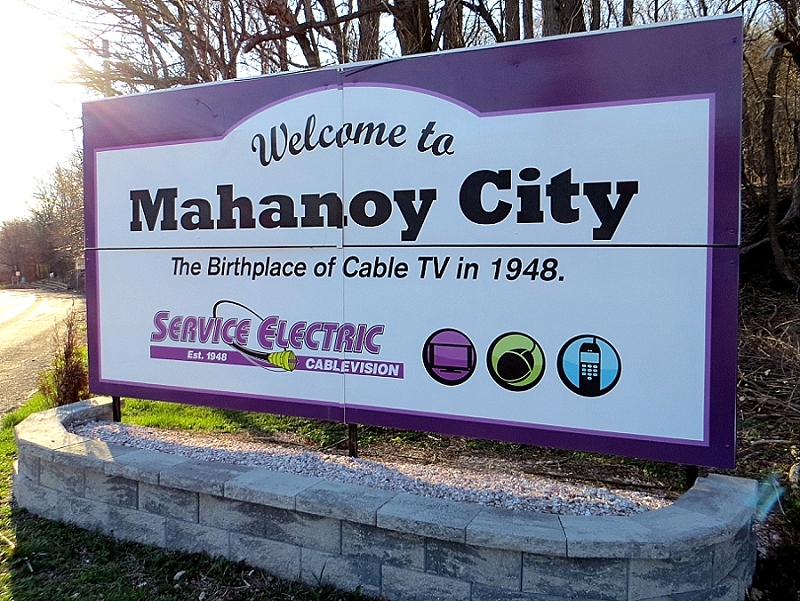 Nobody is really sure whether this secret society ever existed in Pennsylvania, though, or were just local boogeymen. The powers that be were certainly terrified that somewhere in their labor force was a group of organized activists in a field infamous for its deadly working conditions and mistreatment of workers. And that anonymous green figure stands silently and blindly as a memorial for all those killed during that terrible time. 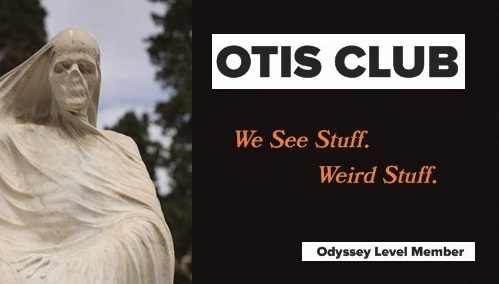 A simple, powerful statue and a confusing story. Although, the town does want to make the statue less simple by adding a second statue to the park, this one of a grieving family member. I kind of hope they don’t. I also kind of wished I’d walked through this park at night. By myself. Without knowing about its existence first.